Clearly, this ride makes a vivid impression on people, whether for its eye-popping scenery, its quad-popping climbs, or its daunting descents. If it’s not the most beautiful ride ever, it’s certainly on a short list of such rides, and as for the terrain, if you tackle it at something less than pro-race pace, it needn’t be a death march. But for sure, this is a big, epic ride, and is also very remote. It should be attempted only by fit, self-reliant riders. This ride is much more than just King Ridge though. That celebrated road only accounts for 16 of the day’s 55 miles, but many of the remaining miles are every bit as entertaining or at least close. It may be that when people refer to the great experience of riding King Ridge, they implicitly include all the other roads that make up this loop. There is hardly a mile all day that isn’t a gem. The ride begins in the little town of Monte Rio, from a parking lot on the north end of the bridge over the Russian River. There is a rest room here which is usually open. Leave the lot and turn left on River Road. For the next few miles, we’ll cruise downstream along the river and then, after a turn onto Austin Creek Road, upstream along that pretty creek. River Road is nearly flat, well paved, and quite busy. Austin Creek is a bit more up-and-down (rollers), has funky old pavement, and is very quiet...hardly a car to be seen. Most of these riparian miles are done in deep forest—at this point mostly redwood trees. There are modest vacation homes plunked down here and there along the water’s edge, but nothing in the commercial line. Just past six miles, Austin Creek Road hits Cazadero Hwy. Turn right and roll up this slightly busier, smoother, flatter road to the tiny hamlet of Cazadero, which arrives at mile 9. There is a decent little general store here where you can get sports drinks. There is a restroom at a tennis court on a side road...a left turn off the main road a hundred yards before the store. If you had bundled up in arm warmers and jackets at the start of the ride, this is probably a good place to shed them, because you’re soon going to be working very hard and heating up rapidly. Just beyond the town, we come to a junction. Caz Hwy ends and three roads fork off into the mountains. To the right: Old Cazadero Road (virtually abandoned, often unpaved). To the left: Fort Ross Road. In the middle: King Ridge. While we hope you are up for the big King Ridge ride, there is an alternative here that is a little bit easier. 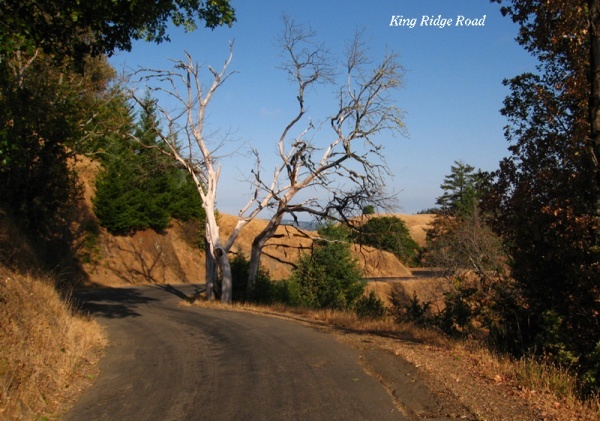 Fort Ross Road cuts across the vast, empty hill country, bisecting the King Ridge loop. It eventually reconnects with the basic circuit at Meyers Grade. Doing Fort Ross will save you 19 miles, leaving a wonderful 36-mile stage. It will still be very challenging (hilly) and extremely scenic. 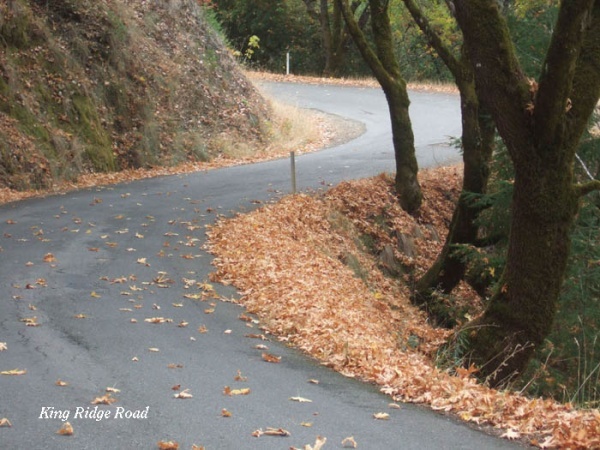 Having to choose between Fort Ross Road and King Ridge Road is an embarrassment of riches. Both are superb roads and it’s a shame to leave either of them unridden. When you look at them both at the beginning, Fort Ross looks tougher than King Ridge. (It is tough, but King Ridge is tougher.) It starts climbing right from the intersection at a pretty intense rate. For the next few miles, it stairsteps up to Black Mountain, with many short and sometimes quite steep pitches broken up with small flats and even a couple of minor downhills. Over the top of Black Mountain, there is a long, technical descent into a canyon formed by the San Andreas Fault. The road then climbs up to the Meyers Grade ridgeline through a beautiful, enchanted forest of mossy oak trees, with wildflowers, boulders, and split-rail fences thrown in as decorative accents. Back to King Ridge... The stoutest (but by no means only) climbing on King Ridge begins just over two miles into the road with a moderate, one-mile ascent, followed by a mile of down, and then a really brutal climb of 1.3 miles, at which point there is a clear summit. A mile of easy, slightly uphill rollers leads to another very stiff climb of just under a mile. At this point, we’ve reached the real world of King Ridge, the part that everyone raves about. Although there are several more significant climbs ahead, for the most part now, we’re riding along the ridgeline, with views off one side or the other. At one point, the road tiptoes along a spine of ridge just a few feet wider than the narrow road. There are panoramic views off both sides of the road at once: to the west, out over the far, blue Pacific, and to the east, spanning rank on rank of empty, serried hills. Sometimes we’re riding through woods of redwood, oak, and bay laurel, and sometimes we’re crossing open meadows of waving grass. Every inch of this ride is beautiful, but up on the ridgeline, the vistas are so stunning, so transcendent, even the most hardened hammerheads slow down and gaze in awe. This is it: purest bike heaven. This is why we ride. In addition to all the buffed-out climbing one does on King Ridge, there are also a number of exciting descents. If one were to ride this road in the opposite direction, a cyclometer would record 1500’ of elevation gain, and for us that translates into 1500’ of twisting, slinky fun. Eventually (at mile 25.6), King Ridge ends at a junction with Hauser Bridge Road and Tin Barn Road. We're going left on Hauser Bridge. Over the next 22 miles, the road we’re on will change names from Hauser Bridge to Seaview to Fort Ross to Meyer’s Grade without really making any turns. It’s all good stuff though, whatever it’s called. Hauser goes downhill the way elevator shafts do: a wild, corkscrew, one-mile white-knuckle tumble down the rabbit hole, culminating in a 20% plunge to a one-lane, iron-grate bridge over the Gualala River. (It was here that Alexi Grewal rolled a sew-up off the rim in the Coors Classic, prompting his colorful assessment of the conditions.) Pavement on this descent ranges from mediocre to dreadful, so you really have to treat it with respect. An authentic 20% pitch with loose gravel, potholes, and tree roots buckling the pavement is a serious piece of work. After the bridge, we have to climb back out of the canyon into which we just dropped...a steep pitch of 1.7 miles, followed by five miles of more moderate ups and downs (mostly ups) along Seaview, where we hardly view the sea at all. There are only two places to refill water bottles in the 40 miles between Cazadero and Jenner: at a roadside hose bib on the right side of the road at the Ratna Ling Retreat Center at mile 28.6 and at the Fort Ross elementary school, just beyond the Timber Cove Road junction at mile 32.8. At mile 36, we arrive at a junction with Fort Ross Road, coming up from the coast. Half a mile later, the other portion of Fort Ross turns left, while we continue straight south on Meyers Grade. This is the point where the shortcut from Cazadero on Fort Ross rejoins the basic route. Throughout the climbs on Hauser and Seaview, we’ve been riding in the trees—close-up scenery without any panoramas—but once we hit Fort Ross Road and Meyers Grade, we emerge onto a ridge above the ocean with views to forever. This is almost as wonderful as King Ridge. It’s not as long—only five miles, as opposed to 16—but it makes up for it with silky-smooth pavement and stunning views. On a clear day, you can look all the way down the coast to Tomales Bay and to Mt. Tam in the far distance. But you may forget to notice the view, once you begin the hair-raising, 16% downhill to Hwy 1. This is a really thrilling ride. You’re screaming downhill, thinking, “Boy, this baby is steeep!” and then you fly over a ledge and it gets even steeper. You think it can’t possibly get any steeper, and then it does the same thing again...and then again! And the beat goes on when you turn onto Hwy 1, with another couple of miles of descent so dizzily twisted the locals call it Dramamine Drive. The grade on Hwy 1 isn’t as steep as the pitch on Meyers Grade, but is probably more fun because of that: you can really let it all hang out. If you encounter any traffic on the busier highway, it’s just as likely that you’ll be passing the cars as holding them up. The road drops all the way to the beach, climbs a small hill, and then traverses the cliff face above the crashing surf, arriving in a couple of miles at the mouth of the Russian River and the town of Jenner. If you look down at the sand bar by the mouth of the river, you ought to be able to see a large colony of seals basking on the sand. There is a small store in Jenner and water is available across the street in a little park. South of Jenner, Hwy 1 meets River Road. Take a left on River and ride up to Duncans Mills on an almost level run (except for one small hill near the start). This is perhaps the most attractive stretch along the entire length of the Russian River, at least that can be seen from a road. Often the river is far from the highway or is obscured by trees and brush, but on this section, there are many pretty prospects of water and rock and beach right next to the road. If you’re interested in birds, you may be able to spy out osprey here, several of which roost in the tall trees on the far shore and dive for salmon and steelhead in the river. River Road (also designated Hwy 116) carries quite a bit of traffic, and in this section, it often lacks shoulders to allow any buffer between bikes and cars. But we ride it all the time because we don’t have any choice: if you want to do this loop, you have to do River Road. For what it’s worth, we’ve never heard of any nasty incidents between cars and bikes along this stretch. Perhaps everyone has figured out how to share the road. At around mile 51, we escape the River Road traffic with a right turn onto Moscow Road in the village of Duncans Mills. This is an attractive little town, and there is a nice bakery and cafe on the right, just after turning onto Moscow. With only four miles to go to the finish, it may seem a little late in the ride for a break. But on the other hand, you won’t find a spot to sit and relax as nice as this when you do get to Monte Rio. Moscow Road crosses the Russian River here and then cruises up the south bank back to Monte Rio. It is almost level throughout. Scenery is more of the deep, dense, dark redwood forest we encountered earlier along the river and along Austin Creek. It will be pleasantly cool under the trees on a hot summer day, but damp and clammy on a winter day. Moscow hits the town of Monte Rio at mile 54.6. Turn left on Main Street and then left again onto the bridge that crosses to the north bank of the river and the parking lot where the ride began.